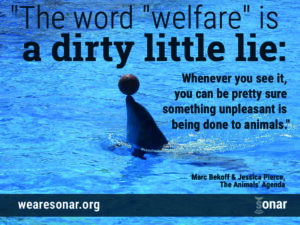 Jessica Pierce and Sonar advisor Marc Bekoff shared thoughts with us about their forthcoming book, The Animals’ Agenda, to be released on April 18 2017. Click here to purchase this insightful and compelling work. Out of many long, spirited, and wide-ranging discussions, the organizing principle of Freedom emerged—as the antidote to “welfarism.” We revisited the original Five Freedoms that were developed in the 1960s and which form the cornerstone of animal welfare science. The science of animal well-being focuses on individual animals and would not allow animals to be used and abused in the way that welfarism allows. Welfarism puts human needs first, and tries to accommodate animals within the “human needs first” framework. Well-being broadens the question of “what do animals want and need” beyond the welfare box, and tries to understand animal preferences from the animals’ point of view. For example, welfarism asks whether mink on a fur farm would prefer taller or shorter cages; well-being challenges the idea mink should be in battery cages on a fur farm in the first place, because they cannot have true well-being or “good lives” under such conditions—no matter how many welfare modifications we make. It is and it isn’t. While some of the changes at SeaWorld are better for the animals who are locked up there, they are not enough and we would like to see animal welfare societies be much more insistent on further changes. So, while it is a form of “humane washing,” it is not as egregious as it could be. Bioethicist Jessica Pierce, Ph.D., is the author of the book The Last Walk: Reflections on Our Pets at the Ends of Their Lives (University of Chicago, 2012). Some of the questions she explores are: Do animals have death awareness? Why is euthanasia almost always considered the compassionate end point for our animals, but not for our human companions? Is there ever a good reason to euthanize a healthy dog? Why do people often grieve more deeply for their pets than they do for people? What is animal hospice? Her other books include Wild Justice: The Moral Lives of Animals (written with Marc), Morality Play, Contemporary Bioethics: A Reader with Cases and The Ethics of Environmentally Responsible Health Care. Visit Jessica’s website for more details: www.jessicapierce.net. Marc Bekoff, author of The Emotional Lives of Animals, The Animal Manifesto, Rewilding Our Hearts, and Editor of Ignoring Nature No More: The Case for Compassionate Conservation, is professor emeritus of ecology and evolutionary biology at the University of Colorado, Boulder, and a former Guggenheim fellow. He has published more than a thousand scientific and popular essays and thirty books. He lives in Boulder. His homepage is marcbekoff.com . The word “welfare” is a dirty little lie. While some of the changes at SeaWorld are better for the animals...they are not enough. Enrichment might provide a “better life,” but it cannot provide a “good life”.